There is a lot of different stuff written about sales and marketing and even more specifically tech sales & marketing. Much of it is very good; some is awful. But what I think is an under-covered and under-appreciated aspect of sales and marketing activities is the earliest stages of a technology company’s existence. Most marketing lead development programs categorize prospects by their “demographic” profile such as “Middle-aged, director of accounting in an Oil & Gas company with $5000 budgetary authority”. This is of course very useful segmentation, but especially in the early days of a tech company it is not adequate by itself. It is also very important to categorize prospects by their “psychographic” profile. A psychographic profile defines how a prospective buyer actually BEHAVES, rather that what they look like from the outside (demographics). So let’s go back to our simple-example demographic-profile of a “Middle-aged, director of accounting in an Oil & Gas company with $5000 budgetary authority” for a moment. Many individuals might fit this profile, thus appearing to be exactly the same from a demographic perspective. You ought to be able to market and sell to them in exactly the same fashion, right? But in fact, among any two of these demographically equivalent prospects their purchasing proclivities could be the extremely different, even diametrically opposite. This is the weakness of using strict demographic segmentation in your marketing and sales efforts, which is particularly flawed in the very early stage of a company’s life. I’d like to note that this is as applicable to a B2B SaaS company as it is to a high volume consumer hardware company. The concept of a psychographic profile came to marketing theory as part of the Technology Adoption Life Cycle, which many of you may be familiar with. Interestingly, the original use of this concept was developed for agriculture and home economics. One of the original developers of the TALC theory, Everett Rogers, then further generalized the theory to other markets. 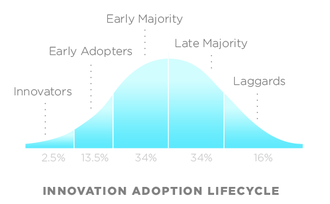 This theory is based upon the diffusion of innovation adoption over a classic bell curve, with 5 categories of adopters (buyers): innovators, early adopters, early mainstream, late mainstream and laggards. Others have suggested variations of the theory. Notably in the technology business, Geoffrey Moore (in his book Crossing the Chasm) suggested that for disruptive product innovations there is a gap (chasm) that sits between the first two groups (innovators and early adopters) and the early mainstream. To understand how your expected addressable market actually SHRINKS in the very early stage being discussed in this article. Studies have shown that in technology markets, only 2.5% of the total market are typically innovators and just 13.5% can be categorized as early adopters. 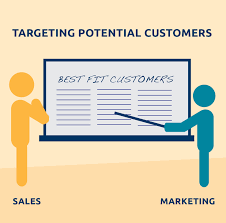 This means that as you embark on your initial sales and marketing activities, the total number of customers that realistically might buy from you at this early stage is just 16% of what you believe to be your full market size. The technology market cycle concept can be extremely valuable if utilized correctly, but I find that in actual practice it isn’t used much at all. Again, most target prospect lists are drawn up demographically. This may be out of ignorance, or it may just be a practical matter. It’s much easier to categorize prospects from afar on a demographic basis, than it is on a psychographic basis. But certainly an awareness of the attributes of those who are realistic targets at this stage (innovators/early adopters) should be instructive to the tenor and types of marketing approaches used in the early days. A great way to find those innovators/early adopters is to get them to “self-identify”; have them come to you instead of your outbound activities seeking the proverbial “needle in a haystack”. This can be done most efficiently by using inbound marketing techniques which provide the slant that these “market makers” are looking for. Innovators have an innate need to “be first” in finding and adopting new technologies and products. Early adopters are also looking for these bleeding edge products and services; albeit driven by different motivations than the innovators. These early adopters are the smart folks that are using new, innovative products to gain a early lead or edge in their market. Although driven by different internal stimuli, both categories can be found lurking around highly technical organizations and reading technology-oriented publications. So continue your outbound activities, but supplement them with a robust inbound marketing program. Where I find that psychographic profiling should and could be very useful –but almost never is used – is in the sales process. Once you’ve engaged with a prospect, if you ask the right questions and listen carefully to the answers, you now have the data to properly categorize that prospect into one of the TALC buckets. If you’re in the very early stage with a disruptive product and the prospect you’re calling on profiles outside of the innovator/early adopter categories–move on! Don’t waste time actively selling to this prospect (put them in a nurturing campaign), because at this stage they are non-buyers. I believe that every sales process should include steps to categorize prospects by psychographic profile, from the very earliest stage of sales engagement. I generally believe that bench-marking your company vs. the competition, like-sized non-competitors in the same general market space, etc. is a great idea. However, when you’re talking about a startup software or hardware company at the very earliest stage, caution alarms start going off for me. In fact, I believe that looking at “averages”, metrics such as sales or marketing expense as a percentage of total revenue, or the average length of a sales cycle, for example – are likely completely misleading as they pertain to these earliest days. You don’t tend to see a lot of operational statistics published specifically for these early stage companies–with good reason. Things change very fast at this stage, so it’s very hard to pick a “point in time” where comparisons make sense. So trying to compare your company’s expenditures or performance to some other bucket of startups which are at very different stages of development can be dangerous and lead you to very wrong conclusions. It’s also not a great idea to compare your company to your buddy’s company; “one” isn’t a good sample size statistically and the chances of the other company’s situation being similar enough to provide a useful comparison is slim. I realize that it can be really uncomfortable for a startup tech CEO to be spending 50% of his revenues on marketing, or that his average sales cycle in the early days is over a year! Especially for the prototypical technical founding CEO with little marketing or sales background. But these things happen in startups because you’re still finding your way. I’m not telling you to avoid being self-reflective about your situation, or saying you shouldn’t try to improve it. This is essential! But don’t get bogged down by what happened to some other company at this stage, because every startup journey is pretty unique. The best metric to use for critical activities at this stage is whatever it takes. What should the early stage tech marketing vs. sales mix look like? Again, there is a natural tendency to want to use some type of industry metrics to decide what your sales/market mix ratio should look like. Don’t do it. Just as in the paragraph above I caution you against judging the SIZE of your metrics vs. some industry norm, the sales/marketing mix really has nothing to do with industry norms. It depends primarily upon your BUSINESS MODEL, which frankly, isn’t always fully baked at this point. The biggest question to ask should be “is my business model more sales-driven or more marketing-driven”? You should be able to get a sense of this by looking at some of the other factors of your offering: price point, product complexity, direct vs. channel, inter-operability, etc. In general, less expensive and less complex situations should usually be marketing-driven, while more expensive and complex products are often more sales-driven. But almost every situation is unique and there is a lot of gray in between the two extremes. So sometimes you have to play around with your sales & marketing model/mix before you find the right balance. Place minor bets to find your way: try out marketing programs on a pilot basis before you commit big budgets to them, and hire one sales rep rather than five at the same time. Finding the right sales and marketing mix is often more of a journey than a point-in-time decision. Don’t hire a large sales force – or maybe any at this early stage – YET. Don’t get me wrong, hopefully your founding team has a senior executive with an “outside focus” on markets and customers, such as a VP-Sales or VP-Marketing. He or she should ideally be driving this effort. If you don’t have someone fitting this description on your team, it suggests a whole other set of potential issues. But at this stage it’s “all hands on deck”; anyone on the founding team that can raise the odds of early sales success should be involved. This often requires a team approach, rather than a single individual. The most important thing that can come of these early sales calls is nailing down a winning value proposition and also a repeatable sales process, which can be used to train that sales force that you’re itching too hire. This phase also begins the building of reference list of key early customers (see below). To summarize, my rule of thumb for VERY early stage sales: nobody can sell like the founders. Lastly, one of the most important goals for your early stage sales and marketing efforts should be building a reference or testimonial list. You’re aiming for a customer reference list if it’s “big-ticket” items that your selling. If your product is more of the low-cost, buy-it-off-the-website type, then it’s really more important to get testimonials of early customers to put on your website and in other marketing materials. In either case, the goal is to establish market credibility with those innovators and early adopters, which you can then use to jump that critical and difficult gap into the much larger early mainstream segment of the market, where the real money will start to be made. Start with a free beta program; it can be helpful by getting a customer “hooked’ on your product at this early stage by starting off with no cost to them (as well as giving them an avenue to affect the product direction). Give them a deep “beta” discount and ask if they’d be willing to serve as a reference. In my experience, the folks who are excited enough about your product to participate in your beta program represent an excellent pool of folks who may willingly sing it’s praises as a reference to other prospects down the road. When pushed by early prospects on price–say yes! The important thing is to make a sale at this stage, building that customer list – not maximizing revenue or profit. But instead of simply capitulating on price, negotiate that lower price in return for the prospect allowing you to publish a case study based on their experience, use their name publicly in your marketing activities and serve as a reference customer. Those are my thoughts on the most important considerations for successful early stage tech sales & marketing in a startup software or hardware company. What does your list look like? Post a comment with you own criteria, or a ask a question about a point that you’d like clarification on. Excellent article! should be required reading for any tech startup execs. I’ve heard that a startup tech company needs three specific items to start selling: a working demo, a white paper, and a slide deck. The demo can be part working and part simulated, as long as you tell your prospects. The white paper can discuss the need for the product, and its key features and benefits. This can be a key element of the inbound marketing. The slide deck can be boiled down from the white paper to cover the highlights, and delivered live to innovators or early adopters. That sounds sensible to me. Oh and of course, the company needs an effective one-sentence elevator pitch for the product. And memorable product and domain names help, too. Great article. Practical and executable advice to keep any founder from getting too far over his/her skis. Keep it lean, keep it scrappy do whatever it takes to close those reference customers. Too many promising startups invest their precious capital into scaling ahead of the curve based on unrealistic notions of first mover advantage.